What a Mitt Romney presidency might mean for Latinos. Former Massachusetts Governor Mitt Romney won the Iowa Republican Party Straw Poll this past weekend. Additionally, reports have just come out that he’s worth an estimated $247 million, making all of the fuss about Democratic candidate John Edwards’ riches look like much ado about nothing. John Edwards reports assets of about $30 million and has drawn criticism for his mansion and expensive haircuts. Should Romney become the Republican nominee for president or even the next president, I think that we need to examine his record closely and determine the implications for the Latino electorate. First off, how many of you know that Mitt Romney’s dad was born in Mexico? That’s right, George W. Romney, father of Mitt, was born in Chihuahua, Mexico. George Romney’s grandparents were polygamous Mormons who left the United States when the federal government began to crack down on the practice. Today there are still Mormons in this part of Mexico, including some distant relatives of Mitt Romney. If you look at this article and scroll down, you will see a picture of some of the Romneys who currently live in Colonia Juarez, Chihuahua, a Mormon enclave. From what I understand, polygamy was illegal in Mexico when the Mormons first settled there, and as far as I can tell, it is still not permitted. Apparently, this particular group of Mormons in Colonia Juarez does not practice polygamy today, but there are fundamentalist sects, broken off from the main LDS church, engaging in the controversial practice in Mexico, parts of Canada and here in the US. Today, Mitt Romney ironically, takes a very anti-immigration stance. His ancestors immigrated to Mexico to have multiple wives, while immigrants from Mexico come to the United States primarily for economic reasons today. While I believe that we need some sort of comprehensive immigration reform, I was hoping that Mr. Romney would be a little more sympathetic to our neighbors south of the border given his connection to Mexico. Last year, Romney spoke positively about providing a path toward citizenship for illegal immigrants, but it sounds like he has heightened the anti-immigration rhetoric, saying that illegal immigrants should get in line to come to the US. Uh, can anyone tell me where this line is? Is it outside of the local Home Depot store where American builders and contractors wait to pick up undocumented day laborers? Mitt Romney also has a terrible record on diversity. While I can’t wait for George Bush’s administration to end, I have to give him a little credit for making an effort to create a somewhat diverse cabinet. GWB’s people might not be the most competent, but that doesn’t mean that there aren’t Latinos, blacks, Asians, women, and gays who have the qualifications and who could do a wonderful job. Earl Ofari Hutchinson writes that Romney had an atrocious record as governor of Massachusetts for appointing minorities and women to judicial posts. It wasn’t until his last year in office that he made more appointments of women and minorities, which seems to be a calculated move as he was gearing up for the big run. And even though he doesn’t like to talk about it, there’s the whole Mormon issue, which I started to address in mentioning Romney’s own familial immigration story. I respect anyone’s right to practice a faith, but this is a rather peculiar religion. Up until 1978, blacks were not allowed to be in the Mormon priesthood. Additionally, Mormons believe that the Native Americans came from the Holy Land and were marked with darker skin to identify their wickedness. If you read the Wikipedia definition of a Lamanite, you will gain some insight. 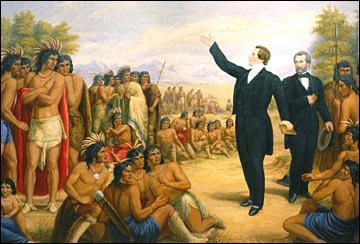 So among the Mormon faithful, those of us with Native American lineage bear the mark of the curse of God. Oddly enough, Mormons have a hard time trying to refute the piles of data suggesting that Native Americans came here from Asia. Imagine telling the Palestinians and Jews in the Holy Land that we have a stake there too?! Now, some might say that we should ignore this whole Mormon thing, but I don’t think that we should dismiss it so easily. Sure, people of color have not always been treated well by modern religious sects, and yes, 47 years ago, JFK had to explain that he would govern separate from the Catholic church. But note that JFK did not go on a Catholic mission, aiming to convert people to his faith. Mitt Romney skipped out on the Vietnam War to go proselytize for a faith that had and still has exclusionary values. If you look at the biographies of Romney’s sons, they, like their father, all attended the Mormon college, BYU. How many Catholics, Jews, or Protestants send all of their children to schools within their faith? As Catholic as the Kennedys are, you don’t see them all rushing off to Notre Dame or Boston College. I find the college choice of the Romney boys, given their vast resources to study in so many places, a little strange, don’t you? But wait, it gets even better with these kids. Romney has stated that his sons are serving our country by working on his campaign when asked why none of them are serving in Iraq. I’m sure that many of the soldiers in Iraq would rather sit on a campaign bus and tour the country instead of sweating in the scorching hot desert trying to avoid improvised explosives. By the way, Romney supports the war in Iraq. Finally, Romney also skipped out on attending the National Association of Latino Elected Officials and National Council of La Raza conferences as well. I don’t even think that he sent one of his sons to do outreach at two of our major conferences. I’m going to end this post with a picture of the Romneys. Notice there aren’t any “little brown ones.” Of course, the Romneys don’t need to include us in their private lives should they chose not to, but I have a feeling that if this guy gets in office that his administration will resemble this picture in a way that won’t be good for us. God, this is SO right on. The whole Mormon/melanin thing is sick and scary. Excellent entry. It’s an interesting dilemma Romney faces: how can he persuade everyone that such an important part of every person, like his or her religious beliefs, can be set aside and disregarded. Particularily with such a controversial set of beliefs. As to why I think the core reason why the Media is coming down soft on Mitt… well because they are probably just as dumbfounded as any of us… I mean… REALLY… a Mormon… from Massachusetts!! That is the BEST they can do… *Psttt…* So much for the success of “Jesus Camp”… LOL!!! I know way too much about Mormons, Mormon History, Mormon Doctrine, Mormon duplicity, Mormon culture, temple ceremonies, and Pax Americana will not survive this mindset and continue to move forward as a leader among nations. Go to Utah, Idaho, and Arizona and see how LDS, Inc, represses its communities and fleeces all of them financially and intellectually. Do you want Donny Osmond doing hip-hop? Do you want to buy your beer in limited qualities in a brown bag? Do you want to spend 30 years in prison for smoking pot? Do you want the LDS Church telling you what to do and who you should do it with? If you think Dubya and Cheney are incompetent, corrupt and just stoolies for the oil industry, what do you think this guy will be? Half of his investment portfolio is funded by tithing given in good faith to the Mormon Church, and those monies are reinvested in Vegas casinos, third world enterprises, and armament manufacturers. Do you want to be forced to study the Book of Mormon in public schools? Wake up! Register to vote! Or else we’ll be walking down Rodeo with a shotgun! I am not surprised Mitt Romney has gotten this far in the political process. U.S. Senator Orrin Hatch did not have full support of LDS, Inc., and look how far he got. All the LDS deadweight creating space and lving off your tax dollars in the FBI, CIA, and the IRS, have made large contributions to Mitt and his good friend Dubya. And you wonder why those government agencies are so eager to adhere to such racist policies? Do we really want to travel back to the 1950s when the Civil Rights Movement was necessary so people of color cound have a chance at the american dream? Mitt Romney represents all that is ugly about Mormons. Yes, the LDS church has not come to terms with its racist history. But I don’t see what good can come of replacing racism with religious discrimination. There’s a lot of vitriol here directed at Mormons which makes me wonder if anyone here has known one; does anyone have Mormons in their family? They are people too. I was born and baptized Mormon. My family is still all active Mormon–I have basically left the fold. There’s much to criticize about the LDS church–believe you me, I know–but also much to criticize about the Catholic church or any other church. I’m no supporter of Romney, but there’s no need to draw lines in the sand that don’t need to be drawn. It’s fully possible to address the politics without making it personal. Yave, of course, Mormons are people too. I find it troubling that Governor Romney does not want to comment on the very recent racist past of his church since he is so actively involved. Romney came of age during a time where the civil rights and women’s rights movement were flourishing. He was born in Detroit, a city that has a large African American population. I would bet that he had opportunities to interact with people of color in his formative years. I could criticize many churches and organized religions, that I agree with. However, to actively chose to participate in a faith so controversial and exclusionary is troubling for me. The LDS Church has not come to terms with its racist and extremely violent past, and probably never will. The arrogant and entitlement mentality that fuels Mormon culture literally prevents them from looking inward. Any culture that promotes the belief that the color of one’s skin determines his status with God should not be taken seriously. How Christ-like is that? The LDS Church is an enterprise built on the ignorance of its followers. Its relationship with the John Birch Society expresses its politicial hatreds. It’s practice of plagiarizing masonic rituals for their endowment ceremonies in their temples, displays how original their religion really is. Its mass secrecy regarding their investment strategies, their cash disbursement of tithing displays how dishonest their enterprise really is. Mitt Romney represents not only what is ugly about LDS Culture, he represents a more drastic shift to the extreme right. Think of Jerry Falwell with lots of money and support from the IRS, FBI, and the CIA. The USA used to be a democracy that evolved into a republic. For the last 27 years, America has been dominated and ruled by american corporations. Mitt Romney wants to extend the Patriot Act. Do you want to continue living in a Police State and being told what to buy and how much you should work and fear arrest now that they call hold you in prison without charging you will a crime? Have you forgotten that? Wake up and take that bullet out of your head. Its time to no longer live in fear. Hey Yave Begnet, maybe you should call Karl Rove and advise him about making not making politics personal. Politics is personal. Politics is the method one uses to obtain power over a group. Politics is utilized by everyone to maintain control over one’s core beliefs. Are you going to tell me the LDS Church doesn’t use politics for its own benefit? They still have tax exempt status by the IRS. How do you think that was achieved? How do you think Brigham Young became the President of the Mormon Church after Joseph Smith’s death? Moroni didn’t appear to him and formally annoint him. He seized control. Religious discrimination and racism are so similar, they are nearly the same thing. Remember Hitler was Catholic. And the Vatican provided most of the passports for former Nazis to leave Germany after World War II. The last thing this country needs is a narrow minded religious man in the White House. Look at what Dubya has done with his seven years in office. And he talks to God and gave his heart to Jesus. His administration has fully embraced corruption to achieve its ends. Mitt Romney will be one in the same. The smallmindedness of Mormon culture dictating policy from the White House will make the narrowmindedness of the Bush II administration seem enlightened. And that is so very hard to imagine. Do you personally know any Mormon person? From your post I highly doubt it. I am not Mormon, but I am lucky to write that during my life I have had the experience to visit Salt Lake City and in college and graduate school be acquainted with a number of Mormons. It is difficult to imagine that someone who has had experience with people of the Mormon faith would criticize them in this way. If anyone is coming off close-minded it is those who generalize others based on their religious faith. The Mormons that I had the opportunity to meet were unbelievably solid, genuine, hard-working, and ethical. I would have absolutely no problem entrusting the leadership of this country to a Mormon because they are grounded, honest, and trustworthy. Many people do not like the Catholic faith for small-minded reasons, and I believe the same could be said for Mormonism. Expose yourself to them and their family values and I doubt you will have a problem with Mitt Romney running this country. I meant to limit my response when I wrote “if anyone is coming off close-minded it is those who generalize others based on their religious faith” by including the word “negatively” before the word “generalize”. For those who actually practice a religion devoutly – a religion with a moral foundation – more likely than not are good people. MSL, thank you for joining in the discussion. I have interacted with some Mormons at work and at school. Actually, some of the ones who I have encountered questioned their faith and expressed doubt about some of the teachings. What makes you think that people who practice a religion devoutly are “good people”? We have a president of the United States who people characterize as “devout” and “religous,” and many people would not consider him “good.” I think that we would like to believe that those who are religous are “good,” but I really think that they aren’t any better or worse than those who aren’t as religious, pious, or devoted to any one faith. Hey MSL…do you know any Hindu persons? From your response to this post I highly doubt it. I am not a Hindu, but from my travels to New Delhi and my experience developing software applications they seem to be unbelievably solid. This seems like an ignorant approach to describe your experience with any Mormon person. As a Mormon, I resent the fact that you have only observed what stems as oral conversation between us rather than what our behavior conveys to the world. Do you anything about our religion to make such a statement like that? Do you understand what Latter-day Saint actually means? Do you know what we do in our temples, and do you actually think that organizations that operate in complete secrecy are a benefit to the followers who give 17% of their gross income, and not know where it actually goes? What is your definition of family values? Or are you so gullible you believe anything said from a pulpit. If you think Mitt Romney represents what is positive about political leadership in the U.S. for the next eight years, because he claims to be solid, genuine, hard-working and ethnical then you obviously have the intelligence of a slug. You should get baptized, and experience the whole nine yards. MSL, what is your definition of good people? Is your world viewed exclusively in black and white? Do you ever apply cause and effect to your pattern of thinking? Do you actually know any Christians who espouse Christ-like attributes? Is this what they teach you in graduate school in Utah? I can only assume from your moronic discourse, that you went to school at BYU. This person has an undergraduate degree from an accredited U.S. university?